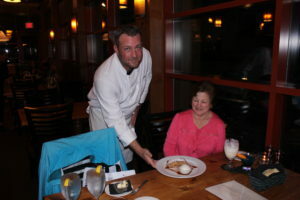 American Press Travel News–Part 2 of Alabama visit by Bob and Barb Epstein “On The Road Again”–After a great dinner at Lulu’s-owned by Jimmy Buffet’s sister. Lulu’s restaurant has become an iconic emporium of drink and vittles, and the place was a real happening for families and anyone wanting to visit an American Caribbean spot full of fun and frivolities. 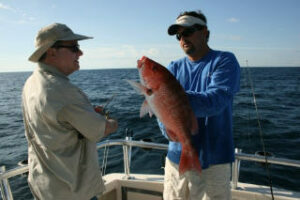 Last month’s article ended with a trip out on the Gulf for red snapper with Captain Randy Boggs of Distraction Charters. Fishing was excellent and we caught and released several fish in the 3-6 pound class with a couple even larger. No, we could not keep any fish for dinner, but the catch and release that Captain Boggs believes is important for the future of the fishery and was A-OK with us too! Do I recommend this Captain? Absolutely! Beverly Hogg really enjoyed herself hauling in these strong-pulling red snapper. 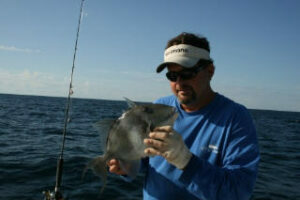 (www.distractioncharters.com Give Boggs or Captain Troy Frady a call at 251-975-8111 These guys are terrific at what they do. Their mate, 39-year old Ken Wright had the right stuff too! The next day we headed for Weeks Bay National Estuarine Research and Education Center- we meandered along a 5,000 foot elevated boardwalk that winds through 6,000 acres of coastal habitats and wetlands, including a protected estuary. 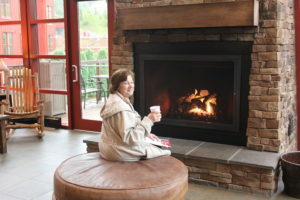 American Press Travel News--Flashback-—Bob and Barb Stopped to Smell the Roses —Just south of Mobile, Alabama, along the 32-miles of Gulf Coast coastline, lies an active beach community called Orange Beach and Gulf Shores. Last month Barb and I had a chance to stay, play, be greeted and introduced to the areas attractions, accommodations and dining spots-from fine dining to waterfront vittles that warmed the cockles of our hearts, although Barb would say: “made no dent in our waste-lines.” Recently the area along with Mississippi, Louisiana and Florida’s Gulf Coast took a hit from a man-made disaster: the oil spill brought to us all by British Petroleum. We went to Orange Beach hoping to find things getting back to business as usual and we found this to generally be the case. Unfortunately, far too many tourists and visitors just don’t know this yet, or assume the worst from the heavy media coverage recently broadcast around the world-rightly so, but now it’s time to tell it like it is today! Our stay was well complimented by having been ensconced in The Beach Club ‘Resort and Condominium project that had everything you could ask for in a great vacation paradise. The beaches were clean and white, the pool complex rivaled anywhere we have ever been that had this amenity, the restaurant served seafood’s and various chef prepared dishes that were quite scrumptious. Our condo apartment rental was 1st class with a wide gulf- view right out our bedroom windows. Barb grew up living on or near the various saltwater shore locations in New York and Long Island in particular. 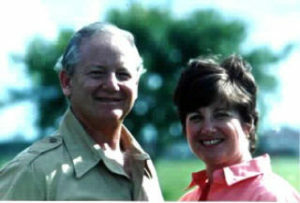 Her dad, Herb wouldn’t have it any other way-he enjoyed and instilled in Barb the same love of the surf and sand at a few beachside communities that had been a boon to me too, as I love it all as well and got to fish into the bargain when visiting my then girlfriend, now 44-years my wife. We’ve been to Orange Beach and Gulf Shores a few times and always loved the friendliness and cleanliness, and this time was like all the rest, except businesses had been suffering from lack of tourists. However, based on many of the restaurants with busy tables full of patrons, you’d never think this was the case right now. One of the restaurants we ate at: The Hangout where Rt. 59 ends and as they say: “the fun begins.” Even Paul Simon came to entertain here at their Music Fest which featured scads of bands and entertainers such as Trombone Shorty & Orleans Avenue group, and the Flaming Lips too to name but a few! We were hungry for a great seafood dinner with king crabs too! We were not disappointed. 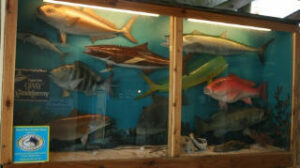 Make a visit to their web site: www.hangoutal.com or call for more info. At (251)948-3030. The Hangout was one swinging place and everyone rousingly joined in the song and dance venues. The next night we we stopped by under the Perdido Pass Bridge at the Cobalt Restaurant. The views of Perdido Bay were spectacular and we ate in a sunset setting al fresco, just outside of the many windows of the inside restaurant. The foods were exquisite, can’t recommend this place more highly and I tend to be conservative when recommending food emporiums, but not here. You can come by any size boat, or by auto. 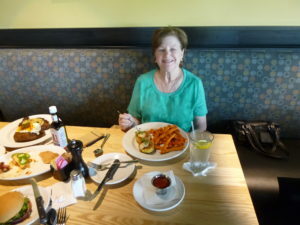 I tried their yellowfin tuna and avocado stack served between fried wontons-scrumptious, Barb had Spanish Paella-all in all a very memorable meal topped off with fried apple pie with ice cream and carmel sauce. Chef Jack Baker really does it up well. The following day I went fishing for red snapper with another writer Beverly Hogg, who was as interested in a great bite as I was. We were not disappointed! As the various trips were quite inclusive and exclusive, yet anyone reading this can enjoy all of the above, there are many more venues we experienced. 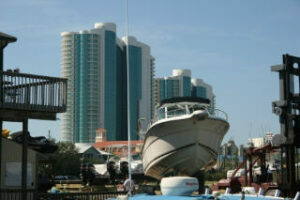 So this is a two part article on Orange Beach, Alabama. Please look for an additional article that will tell the rest of the story next month. 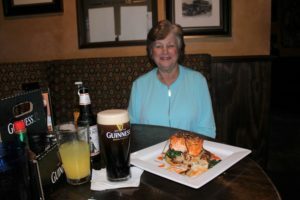 American Press Travel News–November 29th, Port St Lucie, FL.-Bob and Barb–Stopping to Have the Corned Beef & Cabbage at Shindig Irish Restaurant & Pub. 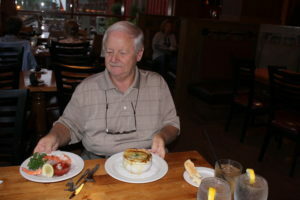 When we met Bob Beepat, owner operator of Shindig, I realized this restaurant has much more than great foods and spirits. There is a personality here, not just in the great décor, but obvious from the way from owner to chef, waitstaff to bartenders people are happy here and it shows loud and clear. Chef Carlos Rosa is exuberant about Shindig he said that “everything is made fresh here, we take great pride in buying local and fresh, People come in to have fun and a social experience, that mixed with a great Stout and some corned beef and cabbage make life long memories.”Barb and I shared several dishes of course one being Corned Beef and Cabbage, another was a drunken Pork Chop and the chips were amazing; made in-house daily and delicious dipped in a tasty sauce. 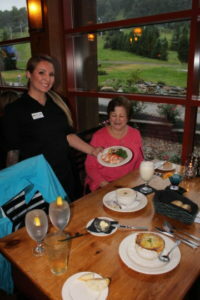 The salmon was glazed and the desserts such as Irish Bread Pudding and a chocolate volcano. A glass of Stout really helped make my day. I felt that I was in a real Irish Pub in Port St Lucie.